Looking for the Technique Tuesday blog hop? Please click here. Hello again! Today, the Lawn Fawn blog is featuring the circle and scalloped circle dies. These dies work with most cutting systems. I have a really old Cuttlebug, and these dies work without any extra shims. Just the A, B, and C cutting boards. The circle set features 8 dies and the scalloped set has 7. And of course, they match in size. Yay for that! 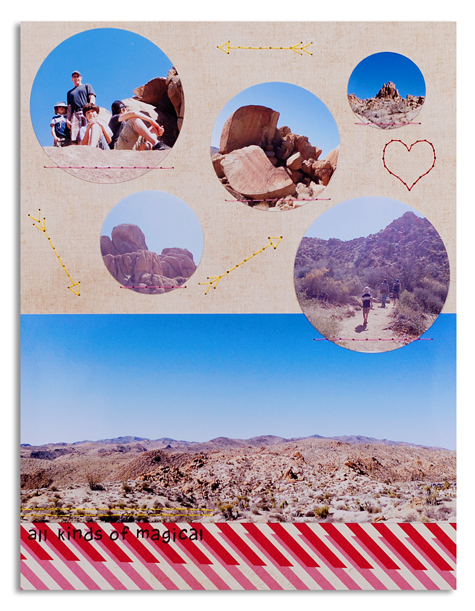 This layout is about our hike in Joshua Tree National Park earlier this year. That place is really magical. Such a strange, beautiful world. If you are ever in that area, I highly recommend it. Although, consider going during winter. It's hot as heck during the summer. Yes, I've been there during the summer. Ten minutes in that heat made me want to cry the ugly cry. Plus, summer is when the rattlesnakes are awake and perky... Just sayin'. 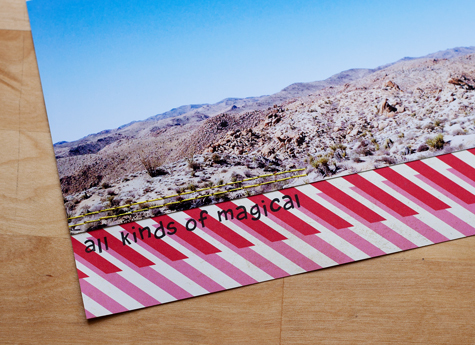 To make this layout, I cut up a sheet of Elle's Studio paper to 8.5" x 11". Those pink and red stripes at the bottom are part of the patterned paper. Love that paper! The photos are cut using the dies. And the title was stamped with Harold's ABC. A little stitching, and I was done. Thanks for dropping by today. Don't forget to go by Lawn Fawn, and leave a comment to win awesome prizes! If you are here for the Technique Tuesday blog hop, please click here. Yo! I can't believe it's mid-June already. My kids are still in school, but this is their last week. Woohoo! This week, Lawn Fawn is celebrating its monthly Inspiration Week. That means, lots of ideas, creative eye candy, and amazing prizes! Today's focus is on Quinn's Capital ABCs. This is a companion set to the other two previous Quinn's lowercase alpha and numbers (I made a layout with the numbers a while back...) And let's not forget the dies! So good! This was a super fun layout to create. The letters were easy to cut out, and then it was just a question of sticking down some tape adding a photo and some journaling, and stitching around the edge. The letters were then adhered with my favorite wet glue (3M Scotch Tacky Glue). Quick and colorful! Thank you so much for coming by today. Don't forget to drop by the Lawn Fawn blog and leave a comment to win some awesome prizes! See you again soon. ps: because a few people have asked... the tape dispenser in the photo is from Target. 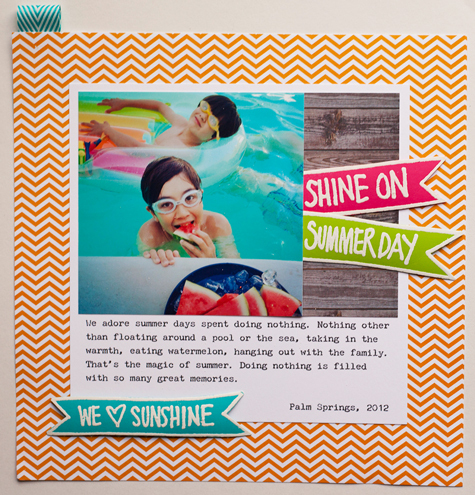 This month's set, Fun In The Sun, is perfect for right now! 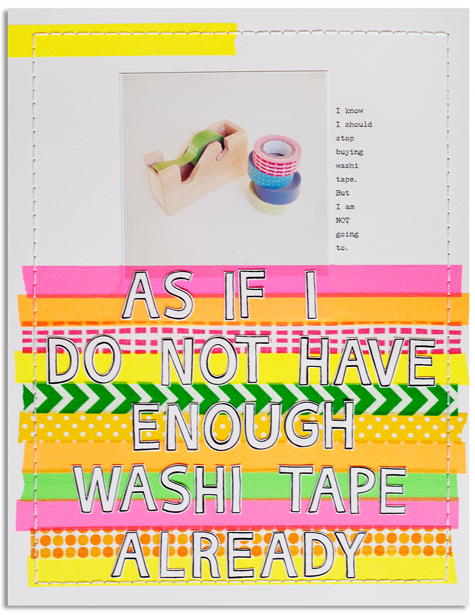 These adorable banners drawn and handwritten by Ali make a great addition to layouts, cards, and other fun projects. 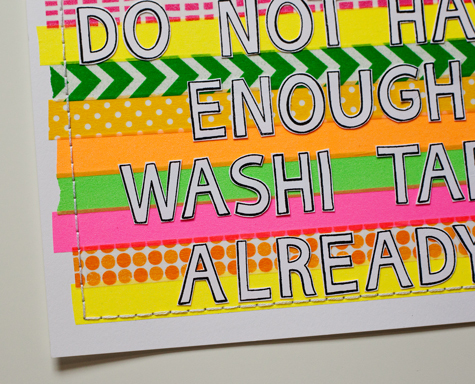 For this layout, I stamped them on bright neon colored cardstock (DCWV Silky Smooth Brights), and embossed them with white powder (American Crafts Zing). These would also be perfect stamped on patterned paper, filled with watercolor or markers, or just on plain cardstock. And of course, they are awesome for Project Life! For lots more ideas, please visit these other blogs along the hop! And don't forget to leave a comment on each blog for a chance to win a $25 Technique Tuesday gift certificate. Again, leave a comment for a chance to win! The winner will be announced on the 15th on the Technique Tuesday blog. Thanks for stopping by!